Abstract: Automated guided vehicles (AGVs) are used to transport containers between the quayside and the stacking area in automated container terminals. The behavior of AGVs becomes complex when a large number of vehicles are involved. The trajectories of AGVs then need to be traversed within certain time windows provided by a scheduler, while satisfying collision avoidance constraints. This paper proposes an new two-level energy-aware approach to generate the trajectories of AGVs in automated container terminals. The minimal-time calculation of AGVs is required for the higher-level controller. The energy efficient controller is implemented in the optimal controller of an AGV that takes into account collision avoidance. This obtained control problem of an AGV is then formulated as a mixed integer linear programming problem. Simulation results illustrate the potential of the proposed approach in a case study. Reference: J. Xin, R.R. Negenborn, G. Lodewijks. 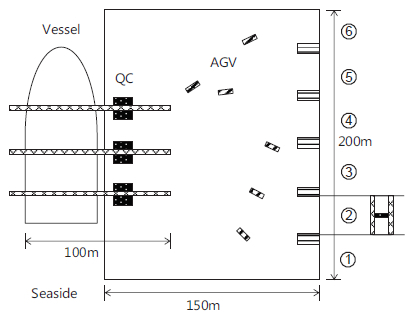 Trajectory planning for AGVs in automated container terminals using avoidance constraints. In Proceedings of the 19th IFAC World Congress (IFAC WC'14), Cape Town, South Africa, pp. 9828-9833, August 2014.